This property is directly associated with the early twentieth century era (1920-1930) when the modern downtown commercial district was fully established as additional high-rise commercial buildings were built. The economic prosperity of the 1920s stimulated the development of numerous major high-rise commercial buildings, as well as smaller-scale bank and specialty retail stores, major hotels including apartment hotels, club buildings and entertainment facilities designed by leading local architects. The northward expansion and establishment of the commercial development lead to the destruction of the original residential district, which was absorbed by commercial and other real estate development. By 1930, virtually all of the old residential district properties - as well as many of the immediate post-fire era commercial buildings outside of Pioneer Square - had been demolished or removed. The Chamber of Commerce Building was designed by Harlan Thomas and the architectural firm of Schack, Young and Myers. It was rapidly constructed by general contractors Rounds-Clist Co. at a cost of $275.000 in a 3 ½ month period, completed in October 1924 and formally dedicated on February 1, 1925. It is particularly unique due to the Italian Romanesque-inspired exterior treatment at the north elevation oriented toward Columbia Street. Harlan Thomas moved west and began his Seattle career in 1906. He is credited with the design of several of Seattle’s most distinctive buildings, including: Chelsea Hotel (1907 ); Sorrento Hotel (1907); Corner Market Building (1911-12, in partnership with Clyde Grainger); the Queen Anne, Columbia and Douglas Truth Libraries (1912-13, with Marbury Somerville); Arcade Building/Rhodes Department Store (1926-27, destroyed); and the original portion of Harborview Hospital (with Clyde Grainger, 1929-31). He is also held in high regard for his role in the University of Washington - School of Architecture where he served as professor of architecture and dean. Schack, Young and Myers were a prolific local firm and are credited with numerous commercial, residential and institutional projects during this era, including: the College Club (also with Harlan Thomas 1920-21, destroyed); Eldridge Buick dealership (now University Center, 1925-26); and Civic Auditorium (now Seattle Opera House, 1925-28). James Hansen Schack and David John Myers were architects, and Arrigo M. Young was an engineer. The firm was founded in 1920, and Myers left the firm in 1929. Most designs by Schack, Young & Myers were in academic eclectic styles. The Seattle Chamber of Commerce was founded in 1882 to promote Seattle’s commercial and economic interests and undertake activities in support local and regional commerce. The organization was originally housed as a tenant in an early mansion that still stood near the site of the new building. By 1924, the organization had outgrown its tenant space in the Central Building and embarked on the construction of a new building that would be the “embodiment of the Seattle spirit, a highly useful monument to civic progress and a realization of the dreams of the city’s courageous pioneers.” The Chamber organization originally occupied the upper floor levels with offices and exhibit space for the promotion of Northwest products. Public spaces included a spacious dining room that could accommodate over 700 people, several private dining rooms and a large club room/lounge. The Seattle Real Estate Board, the Seattle Chapter of the American Association of Engineers, and the merchant’s Exchange were also housed within the building. As of January 1, 1925 chamber membership was 3,151 and it was hoped that the new building would arouse more interest in membership and further the goals of the organization. Storefront portions of the building were modernized c.1955. In 1970, The Richardson Associates-TRA (the successor firm to Schack, Young and Myers) undertook a renovation project including the introduction of the non-historic arched storefront openings and became major tenants. In 1983, the Chamber of Commerce vacated the building to move to One Union Square and TRA purchased the building for its own use. The current owner and tenant, Pacific Northwest Title undertook a major multi-million dollar interior renovation after they acquired the building in 1997. Despite extensive interior alterations, this is a generally intact example of a commercial business block property type; however, few buildings of this mid-rise scale appear to have been constructed in the 1920s, as major highrise and two-story commercial blocks were most common. This property is highly unique due to its original ownership and use and as a particularly noteworthy example of Romanesque Revival style designed by a highly notable Seattle architect, Harlan Thomas. Located at the SW corner of Third Avenue and Columbia Street, this highly distinctive commercial building exhibits exterior features drawn from Italian Romanesque designs, specifically 12th century churches located in the Piedmont/Lombardy region. The most prominent four-story portion of the building is oriented toward Columbia Street and is evocative of a basilican church façade. It is juxtaposed to the three- story commercial block portion of the building at the corner of Third Avenue and Columbia, which is also overlaid with Lombardic architectural ornament and detailing. The steel and reinforced concrete structure measures 111’ x 120’ and is clad with cast stone (fabricated by the Olympian Stone Company) in thirteen subtly differentiated hues of buff with pink, light blue, and yellow highlights. The varied hues and grooved texture give each panel the appearance of hand-cut stone reminiscent of medieval construction. The building is unique to Seattle architecture due to the particularly rich ornament at the Columbia Street entry facade, which exhibits a combination of distinctive early Christian and medieval motifs. 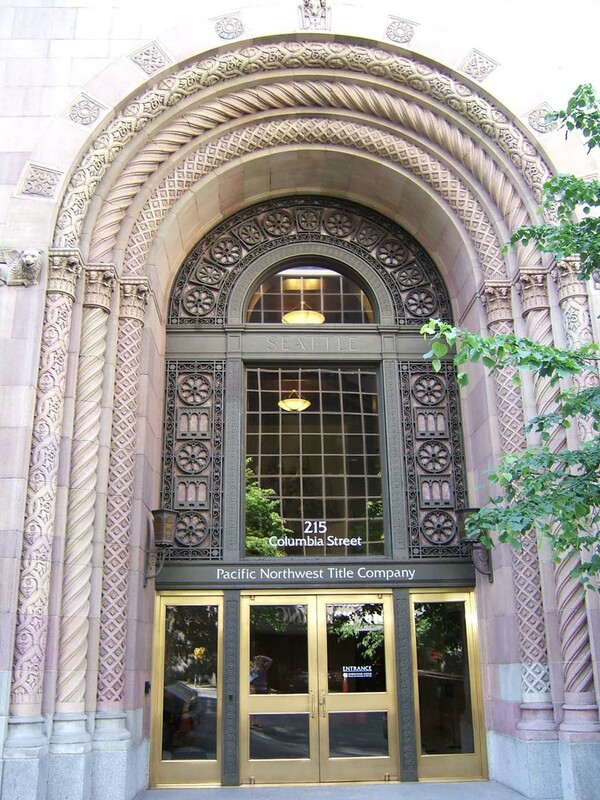 The prominent two-story central entry portal is flanked by horizontal friezes depicting native and modern industries in Washington State presented in a distinctly Romanesque design mode. The multiple twisted and incised columns and arches within the portal are indicative of both Celtic motifs used in early Christian art as well as Muslim and Arabic design precedents that influenced Romanesque architecture. The pedimented façade is capped by a Lombardic-inspired frieze above an arched corbel that depicts animals indigenous to Washington State. The façade is further distinguished by arched wall elements, arched window openings and ornament and a central rosette window. The rosette window and multiple arch motifs are incorporated into a highly ornate window wall located above the modern bronze doors at the entrance vestibule. The more conventional three-story portion of the building exhibits a two-part commercial block façade composition. It was originally distinguished at the storefront level by wide segmental arched openings with multi-paned mezzanine level windows. These opening have been rebuilt to include modern round-arched storefront construction. The east elevation is divided into seven bays and the north elevation into three bays, with sets of windows at each of the upper floor levels. The Romanesque revival design is conveyed via round-arched window openings at the upper floor level, recessed spandrels with multiple arched panels and a distinctive Lombardic corbel table at the parapet. In addition to the storefront alterations, all of the original double-hung and multi-pane window sash appears to have been replaced by fixed glazing panels. The entire interior of the building has been repeatedly remodeled and there are no significant interior finishes, features, or public spaces. "New Chamber Building Marks City's Progress" Seattle P.I., January 18, 1928.